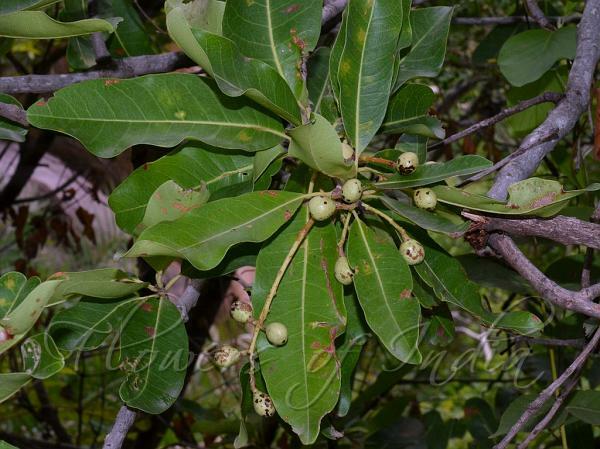 Cuddapah Almond is a tree up to 10 m tall, hairless, branches stout, bark rough, deeply fissured. Leaves are linear-oblong, elliptic or elliptic-lanceolate, rounded or narrow at base, entire at margin, blunt, rounded or notched at tip, 7.5-15 x 3-5 cm, smooth, netveined, lateral nerves 12-15 pairs. Leaf-stalks are 1.75 -3 cm long, slender. Flowers are 3-6 mm across, in axillary and terminal hairless branched panicles, white. Sepals are 5, semicircular, about 1 mm long. Petals are 5, oblong or ovate, about 2.5 mm long. Stamens are 10, anthers oblong, ovary hairy. Fruit is obliquely globose, about 1.25 cm, slightly compressed. 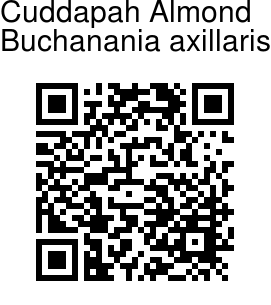 Cuddapah Almond is found in South India and Srilanka. Medicinal uses: The seed kernel and bark of Priyala is used in the form of decoction to treat intrinsic haemorrhage, diarrhoea with blood and as tonic.As tonic:Grown up child who has left the breast-milk should be given sweet bolus prepared of priyala (kernels), madhuka,(Glycyrrhiza glabra) honey, parched paddy and sugar candy. It acts as saturating and tonic (AH.U.139). Kernels of the priyala made into a powder and used with milk as an aphrodisiac, in case of fever and burning sensation.dysentry: powder of the bark mixed with honey is useful in dysentery with blood. Identification credit: Ganesh Babu Photographed at Makalidurga, Karnataka.